“Dave! Dave! Come quick! There are cows!” Jen’s eyes were wide with astonishment as she pointed excitedly to the brown and white faces peering over the fence. Jen was a city girl through-and-through, having been born and bred in Manhattan. 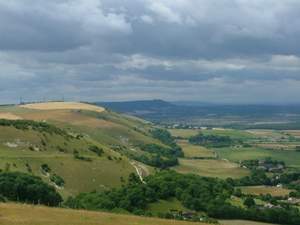 Dave was a Sussex lad who loved the majestic South Downs and undulating coastline. They say that opposites attract – and this was the case with Jen and Dave who literally ran into each other while jogging in New York City’s Central Park. While trying to avoid the same large puddle, they collided. Her 115 pounds were no match for his 190 pounds. Jen lost her balance and ended up in the muddy water. “I’m so sorry!” he said, helping her to get up. “I think you owe me an entire breakfast,” she said in mock indignation. Soon they were exchanging life stories in a nearby bagel bar. Dave explained why he was living in Manhattan. “Computers? Does mean you’re a nerd?” Jen teased. And so began their relationship which grew deeper and deeper as the months flew by. When the time came for Dave to return to England, he knew he could not bear to leave Jen behind. While Jen packed up the apartment they had been sharing, Dave flew back and set about finding a place for them to live. He had beguiled Jen with descriptions of the beautiful Sussex countryside where he grew up.“You get the best of both worlds — the sea and the South Downs.” Thanks to computer links, she was able to ‘view’ houses, leaving Dave to make the final arrangements. All she had to do was arrive at Gatwick and be whisked down to their new home. And here she was, only months later, admiring cows. The next morning dawned warm and sunny. Jen woke early, keen to get started. Dave, however, was still fast asleep. “Oh well. I’ll just go for a short walk by myself.” Wearing shorts, a T-shirt with strappy sandals on her feet, she set off for the woods at the top of the lane. The foliage was dense with summer growth.“Arrghh!” she cried out in pain. A red rash quickly emerged on skin. She rubbed her legs which only intensified the burning. Dave was awake when she charged through the door minutes later. Soon they were exploring the downland near Chanctonbury Ring. As part of his ongoing plan to ‘countrify’ his wife, Dave decided to take her fishing. She followed him up into the loft to inspect the gear he’d accumulated for this hobby. Dave stopped to investigate. “Mystery solved,” he announced. Look up there.” Hanging upside down from a beam was a furry, leathery-eared bat, sound asleep. A few days later, while Dave was at work, Charlie’s wife Jill came round to introduce herself. Jen eagerly accepted the invitation and, as she entered the Spencers’ yard, four white birds came charging at her from different directions, honking and spitting aggressively. Jen froze. Jill heard the din and flung open the front door. “Your ducks are attacking me!” Jen hollered. “But aren’t they kind of like pets?” Jen asked as she entered the Spencers’ cosy kitchen. As the weeks wore on, the two couples began to socialise more and more. The first course Jill served was soup made from home grown parsnips. Next came a platter of roast leg of lamb with all the trimmings. “Genuine South Downs lamb,” she announced. “This is indeed local lamb, but not that local!” Jill laughed. Autumn came and with it long walks during which Jen and Dave gathered sloes to make sloe gin. They collected sweet chestnuts from the abundant trees in the woods and roasted them in the oven. Dave cut up logs with his new chainsaw and Jen helped by stacking them neatly in the log store. He taught her how to lay a fire and bank it at night so as to revive it in the morning. Spring turned into summer. Jen spent many hours cultivating her kitchen garden. She’d planted seed potatoes and Jill gave Jen some of her surplus tomato and courgette plants. With Dave’s help, Jen also grew sugar snap peas, rocket for salads and leeks. Particularly picturesque were her climbing beans – the red flowers of green runners mingling with the mauve flowers of purple ‘blauhilde’ climbers. Dave took myriads of photos of Jen’s produce which she emailed to her mother back in New York. It was a hot – for England – August day when Dave proposed they pack a picnic and head off to West Wittering beach. Having seen the shingle on Worthing and Brighton beaches, Jen was thrilled to find miles of sand at West Wittering. The picture-postcard views of Chichester Harbour delighted her, as did the herons, egrets and plovers they encountered on their beach walk. “Are you ready to brave the waters?” Dave asked. Removing their outer clothes to reveal swimming costumes underneath, they headed off to the surf, hand-in-hand. “Oh!” Jen shrieked as soon as the cold waters swirled around her ankles. “It’s like walking into ice cubes! I’m out of here!” She tore back to their picnic site and proceeded to dry her feet vigorously with a thick towel. “Cowardy custard!” Dave yelled as he dived into a swell. “Jen!” whooped a jubilant Dave, gathering her into his arms. “I think it must be the country air,” he quipped.